The foundation's benefactor, Hans (Johann Max) Sigrist, was born in Frutigen, in the Berner Oberland on January 2, 1918. His parents operated a livestock feed business and a Gasthof (restaurant/inn). 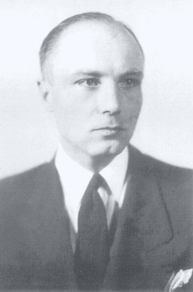 Hans Sigrist studied Latin and modern languages for his Matura, the test allowing him to attend university, and then began his studies at the University of Bern, first studying medicine and later changing his focus to economics. At the University of Bern, he was known as a life-long active member of the Swiss student organization, Helvetia, even after leaving the university. Those who knew him recount his interest in debating politics and discussing literature. He was known for having an extensive library and being an excellent debater. His friends also remember his love for the Swiss countryside, where he often hiked in the mountains and skiied. After leaving the university, Hans Sigrist put his knowledge to use to begin a career in business. He successfully invested the small inheritance he had received from his parents into real estate, the development of raw materials (gravel and stone) for building, and other investments. He parlayed his small inheritance into a much larger one, and eighteen years before his death, already wrote his will, leaving funding for the foundation. Hans Sigrist died on December 30, 1982. The Foundation began to operate in 1993, awarding the first Hans Sigrist Prize in 1994.